It’s too small, and the decor’s passe, Toprak’s new owners say, but at that price what do you expect? To spend £50m on a new house seems excessive; to splurge another £30m on doing it up astonishing. But the super-prime section of the London property market is a rarefied world, with laws of its own. Indeed, the new Kazakh owners of the grandest house on The Bishops Avenue, north London’s billionaires’ row, believe they bagged a bargain when they bought Toprak Mansion earlier this month. But the decor, it seems, is not right. And, despite the five reception rooms, nine main bedrooms and 16 bathrooms, spread over 23,000 sq ft (the equivalent of 15 semis), the place is not big enough. So, although Toprak, the most expensive new-build property sold in Britain, has probably been lived in for only a week or so since it was completed seven years ago, the owners are calling in the builders. By the time they’ve finished, as well as all the basics de rigueur for the self-respecting billionaire – such as wireless audiovisuals, pressurised purified water on tap and automatic security shutters – they will have a 30-seat cinema, squash and tennis courts, a billiards room, a beauty salon, a 24-carat gold-plated whirlpool bath, a new staff lift and a small river, complete with canoe. Even the helicopter gets its own lift: the landing pad in the garden will sink, James Bond-style, into the ground and a roof will slide across on top. The four-storey house with a neoclassical portico was built for Halis Toprak, a Turkish businessman, and has been marketed discreetly for several years. The asking price climbed from an initial £30m as the London property market soared. Agents nicknamed it Top Whack. The new owner of this extraordinary statement of personal wealth is a diminutive 75-year-old woman, Hourieh Peramaa, who fled her native Kazakhstan at the age of 17. A year later, while living in an Iranian refugee camp with not a possession to her name, she met her future husband, a medical student from a wealthy family. 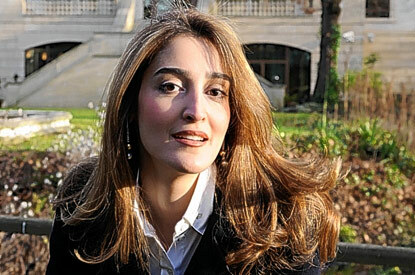 She helped him acquire land and over the years has built a property portfolio worth more than £1 billion that stretches through Iran and Europe. Peramaa, who keeps her name out of the public domain by buying through trust funds, divides her time between the south of France, Toronto and London, and has left her daughter-in-law Yassmin, 33, to coordinate the building work, which is expected to take 18 months. In March, 50 builders will rip out walls, floors, wiring, plumbing and windows. In fact, everything is going apart from the elliptical swimming pool and the double- curved staircase – and even they are being revamped. Two huge Venetian chandeliers are already on order, one for the hall, the other to hang over the pool. A new extension will house the staff quarters. Yassmin has employed one of the “most important” interior designers in Italy, and is flying out weekly in the family jet to liaise. All internal doors are being replaced with automatic sliding jobs, some opened by fingerprint recognition. The controls are cutting-edge and wireless. “There have been a lot of technological improvements since this house was built. Mother-of-pearl tiles, for instance, didn’t exist then,” says the impossibly glamorous Yassmin, who is a good 6ft tall, even without her 5in stilettos, and is surely a size zero. There’s also the matter of taste. “My mother-in-law has high standards,” she says, and there’s little doubt that Toprak, as it stands, is more about grandiosity than style. Finding the right house to buy – even if you are prepared to pay up to £100m – is not easy. The family were looking for two years, and despaired of getting what they wanted. “We thought we might buy one of the penthouses at One Hyde Park,” Yassmin says. “But they were asking £112m, it had a communal entrance and communal pools, and it was only 20,000 sq ft. The layout was all wrong, and the walls come only in magnolia. To have any wall covering, or interior design done, was going to cost another £8m.” At less than half the price, Toprak Mansion, with its 2½ acres, was a bargain. For comparison, Yassmin points out a new 22,000 sq ft house with just one acre, about to be completed a few doors away. It is expected to go on sale for £45m to £50m. What’s a poor billionaire to do? “This was the best she could find,” says Yassmin, who says her mother-in-law is happy to spend what it takes. “She looks at this house as an investment. It’s one of the most substantial houses in the world.” With this in mind, the first thing the family did was change the name to Royal Mansion. “Historically, royal stands for quality. We wanted it to reflect the importance of what the house was going to become, and this road has been associated with many royals over the years, from Saudi Arabia, Brunei and Greece,” Yassmin explains. About half of the £30m renovation cost is expected to go on plumbing, automation, the pool area, the cinema and underfloor heating. Doing up the garden will cost £2m; the heli-lift £500,000. Security is a priority – while visitors will arrive at the stately front door, the owners will make use of a hidden basement entrance. “There’s no angle from which an intruder could shoot a photograph – or anything else,” Yassmin says. When the house is complete, it may become Peramaa’s London base, along with various members of her family and associates. Equally, if another deal comes along, she may decide to sell. Should she stay, the dining table, one of the few fixtures they are keeping, is plenty big enough, as it seats 50. The many grandchildren are sure to avail themselves of the nine bedrooms – there will be another four for staff and three for security detail. The master bedroom on the first floor is 3,500 sq ft, and that’s without the enormous dressing rooms and bathrooms, two of each. So, will prices of super-prime properties continue to soar upwards, despite the turbulence below? Trevor Abrahamson, managing director of Glentree International, the agents who sold the house, is confident they will remain stable, at least. Earlier this month, he set the previous record for a new-build property, £35m, with the sale of a nearby house called Palladio to Lev Leviev, an Israeli billionaire. “Up to about £12m or £13m, it’s mostly English people who buy in northwest London,” Abrahamson says. “Above that, they are 80% foreign, from the Soviet Union satellite countries, India, Nigeria, some from the Middle East. They have usually made their money from oil, and have never been wealthier. London is the financial capital of the world – it is the place to buy properties and they feel they may as well get one. “A lot of these people come from troubled areas of the world and are buying a bolt hole against anything going wrong at home. It is also a statement of their wealth. Frankly, Toprak and Palladio are extreme statements that you have arrived.” Robert Bailey, a property buying agent who specialises in prime central London, also reports a degree of uncertainty at the topish end of the market, at the £3m to £10m level, “but when you get to £20m plus, it’s still extremely active. Yet Bailey fears there may be storm clouds ahead. Proposals by the government, mooted last year, to start chipping away at the highly favoura-ble tax status enjoyed by wealthy “nondomiciled” foreigners who live in Britain – including the introduction of a £30,000 flat rate charge – have led to suggestions that some may quit the country. “If people start going abroad, we are going to find ourselves with a whole load of expensive houses with no buyers,” says Bailey. None of this worries Yassmin, nor her mother-in-law, who is more than happy with her new home. This week, they will host a housewarming party for 400 guests, at which the Dom Pérignon and caviar will flow freely. They are starting as they mean to continue – no expense is to be spared at the Royal Mansion. Rolls-Royces and Range Rovers lined The Bishops Avenue as hundreds of guests poured into Royal Mansion, the boldest and brassiest house in the neighborhood — quite a feat on a street where the Saudi royal family owns 10 homes. Almost comically large men with impeccable manners, like aristocratic bears, checked invitations at the gates at 7 on a Monday evening. Five hundred guests filed through the enormous marble foyer and into the 80-foot-long salon, where uniformed servers poured from $100 bottles of French champagne as if they were watering the plants. The swells nibbled blini loaded with walloping dollops of Russian caviar, flanked on one side by a silently rising and falling glass elevator and on the other by a platinum blonde in pointy leopard-print pumps singing jazz. Somewhere in here, Mikhail Gorbachev was waiting to speak. The man who presided over the Soviet Union’s going-away party was now the guest of honor at the 30th anniversary party of a London real estate firm. Asked to explain why, Trevor Abrahmsohn, the real estate whiz hosting the party, said he and Gorbachev both supported leukemia charities and had Russian friends in common. Gorbachev and the Royal Mansion were both “icons,” he observed, so the pairing made sense. The Raisa Gorbachev Foundation, named in honor of Gorbachev’s wife, who died of leukemia in 1999, said that the former leader received no fee for attending the party but that the foundation had received a “five-figure” — in pounds — donation. The guests didn’t appear to be dwelling on the details. All that mattered, it seemed, was that on a London night as cool as a bucket of diamonds, the Other Half was having what amounted to a big old cash bonfire. “They spent 50,000 pounds on caviar!” said one slightly wobbly blond woman, in a way that suggested she knew what she was talking about, even after a couple of flutes of bubbly. Abrahmsohn and his company, Glentree International, handle some of London’s priciest homes, with special emphasis on The Bishops Avenue, a row of billionaires’ trophies nestled regally next to Hampstead Heath. In the long-ago days when mere millionaires could afford to live here, Elizabeth Taylor had a place around the corner. But she has given way to the Saudis, the sultan of Brunei and Britain’s richest man, steel magnate Lakshmi Mittal. The world’s financial markets may have the jitters, and house prices are dropping, but The Bishops Avenue is insulated from all that by thick fortress walls of money. No subprime mortgages here — buyers pay cash. And no house screams cash like the Royal Mansion, which recently changed hands for about $100 million and has eight kitchens, a Turkish bath for 20 people and a 28-car underground garage. According to Glentree, the new owners plan to spend an additional $60 million to spruce the place up and add a cinema and helipad. Abrahmsohn said the new owners are the family of Hourieh Peramaa, a property mogul in her 70s who is originally from Kazakhstan. At the party, her daughter-in-law, Yassmin, 33, an elegant and towering woman in a remarkable red “hello, boys” dress, worked the room but politely declined to comment when approached by a reporter. She then glided back into the chattering throng, among people sipping Cuban rum and Russian vodka and nibbling from a vast sushi bar set up next to a 40-foot-long dining room table. One man wore a black velvet dinner jacket and a single pearl earring. Another wore a narrow black tie made from what appeared to be alligator skin. Several women were wrapped in fur while others wore barely anything, the competing sensibilities of guests who jetted in from Palm Beach and various winter-bound European capitals. Then Gorbachev emerged from a private room and made his way to a lectern. A month shy of 77, he looked a little heavier, maybe, perhaps a little glassier in the eyes, but still forcefully energetic. He said many countries were “rolling back democracy” because “it had not delivered everything.” He said that the world needed “strong democratic leadership” and that Russia, Europe and the United States needed to work together against poverty and terrorism. “Our history is a common history,” he said. With that, he posed for a few photos and was driven off in a Mercedes sedan, waved on his way by Yassmin, a shivering statue in red chiffon. It was 9 o’clock on a Monday night. Time for the roast beef course. Call me a cynic, but I believe there is more to this story than what was delivered to the press… Does anyone know a Kazakh (or any central Asian) named Hourieh? Why does this “owner” never speak? According to her story Hourieh crossed into Iran in 1950 or 1951, when Stalin was still alive. If she reached Iran, she crossed either from Turkmenistan, or sailed over the Caspian and fled across from Azerbaijan (among the most policed borders in the world). How did she cross one of the most secure borders in the world during Stalinism? Beria was still running the secret police when she allegedly crossed. However, at that time you probably couldn’t travel far beyond your hometown without being questioned by the police. So, who really owns that mansion? I speculate below, but either way, Hourieh did a wonderful job of public relations by trotting out her striking, 6-foot-tall daughter, Yasmin (pictured above), to tell the tale. People use the dull and usual as their cover. They don’t try to hide behind the unusual. Therefore, I would not be shocked to learn that the goal of this entire show were precisely to gain publicity. If the opposite was the objective, then the buyer could have easily made the purchase appear as done by one of the countless Russian millionaires in the world. Russians buying expensive homes in London has become such a commonplace event that nobody would have paid any attention. By setting up this elaborate, exotic and obviously fake story, the buyer has created intrigue. Perhaps the real buyer is one of the thousands of rich Russians who is merely seeking attention? This whole affair has nothing to do with Kazakhstan and I expect that one day the true buyer will come forward to enjoy the limelight. Perhaps I should have Eleonora buy the house next door so I can keep a close eye on my new neighbors and update my readers on this story as it develops? Tags: Hourieh Peramaa, Toprak, Yassmin. Bookmark the permalink.